2. Heat up a large frying pan on high heat for about 2 minutes. 3. Season the lamb loin evenly with sea salt and black pepper. 4. Seal the lamb loin until evenly rendered, so that the fat is broken down a little and turns slightly golden brown with a crisp outer layer. 5. Place on a roasting tray and roast for 25 minutes, or if you have a meat thermometer until it has a core temperature of 54°C. 6. If you don’t have a thermometer, squeeze the sides and if it is firm with a slight give then it is done, allow to rest for at least 5 minutes prior to carving. 1. Place the artichokes on a roasting tray and toss through half the butter. 2. Roast, turning them every 5 minutes, for 20 minutes until golden brown and soft. 3. Place the cooked artichokes in bowl and toss through the chopped garlic, parsley and lemon until evenly coated. Season with sea salt and pepper. 1. Heat up the pan that was used for the lamb on a medium-high heat for 1 minute. 2. Add the remaining butter and melt. 3. Add the onions and cook until soft and translucent but no colour, for about 10 minutes. 4. Season with sea salt and pepper to taste. 1. Place the artichokes on the side of the serving dish. 2. Slice the lamb into 2cm thick slices and fan it out on the dish. 3. 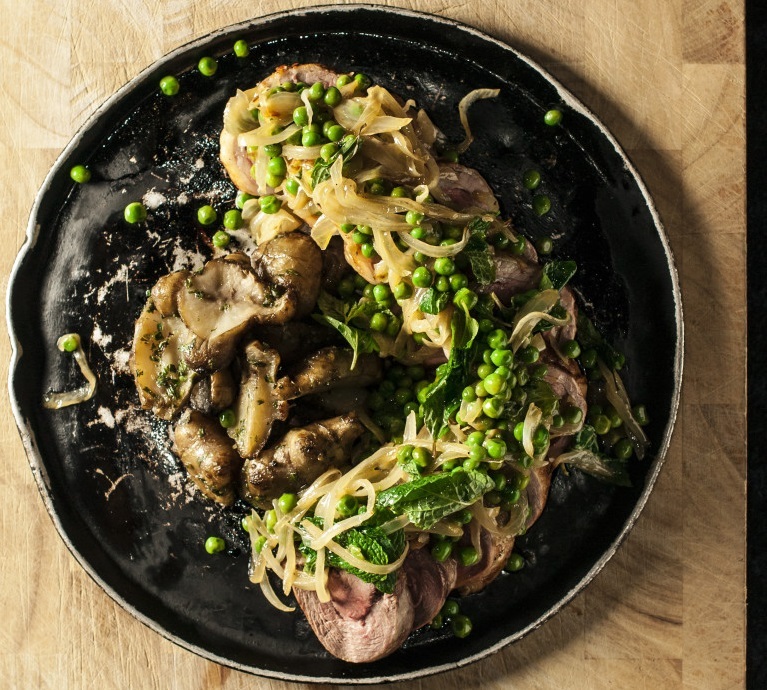 Spoon the pea mix on top of the lamb and garnish with a few sprigs of mint.